A novel method to measure sap flow in plants was recently published Edaphic Scientific and Implexx Sense in the international peer-reviewed journal, Forests. The new method, called the Dual Method Approach (DMA), resolves the measurement range limitation of previous sap flow methods in the heat pulse velocity family of methods. The DMA can measure the entire range of sap flux density observed in plants from reverse, zero, slow and extremely high rates of flow. 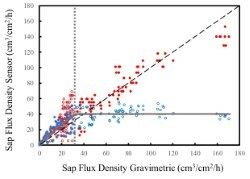 Previously, methods, such as the Slow Rates of Flow, or Heat Ratio Method, could only measure one-third of the total range of observable sap flow leading to large errors in measurements and data analysis. Other methods, such as the Tmax or Compensation Heat Pulse, could not measure slow or reverse flows which can be significant during the night and in hot, arid ecosystems. The DMA supersedes these methods by measuring the entire range of sap flow in plants. A brief introduction to the DMA, with example data, can be found on the Edaphic Scientific website. You can also download a full PDF copy of the paper from the Forests website.